Production workers stack newspapers onto a cart at the Janesville Gazette Printing & Distribution plant in Janesville, Wisconsin, April 11, 2018. The International Trade Commission struck down tariffs placed on imported newsprint after it found U.S. producers weren't harmed by the foreign competition. WASHINGTON — The U.S. International Trade Commission on Wednesday nullified tariffs put into place for imported newsprint by finding that American producers weren’t harmed by imports from Canadian paper mills. 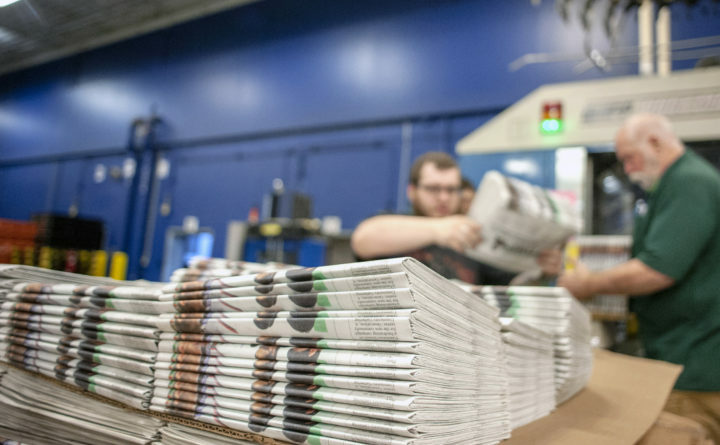 The ruling is a victory for the U.S. newspaper industry, which complained that the rising cost of newsprint, typically their second-biggest expense, made it harder to operate. In July, lawmakers testified before the trade commission that the tariffs were harming the very paper industry they were supposed to protect. That’s because publishers were responding to the additional costs by reducing the number of pages in their newspapers, thus dampening demand for newsprint, the paper used to make newspapers, books and advertising inserts. Others testified that the higher cost of newsprint had led newspapers to cut staffing and the number of local events that they cover. Maine’s U.S. senators, Republican Susan Collins and independent Angus King, and U.S. Rep. Bruce Poliquin, a Republican from Maine’s 2nd District, testified against the tariffs before the commission and hailed the ruling in statements Wednesday. But under U.S. law, the two-part process for making the tariffs permanent also requires the trade commission to find that the U.S. paper industry was harmed or threatened by the imports from Canada. The commission unanimously determined that no injury is occurring. The North Pacific Paper Co. had petitioned the Commerce Department for tariffs to offset duties and subsidies provided to Canadian paper mills. The company had told the trade commission that prices had dropped so low for its paper that it could not justify keeping all three of its machines running. But since the imposition of the tariffs in January, prices have recovered to the extent that it was able to hire back 60 employees and restore pay and benefit cuts made in 2017. The Bangor Daily News is a member of the Maine Press Association, an industry group for newspapers that opposed the tariffs. All newsprint used in Maine is made in Canada.